And now for something completely different! Colourful flowers in many shades nestle amongst attractive cream on green marbled foliage. Eye catching! RHS Award of Garden Merit winner. Rounded, compact and perfect for smaller gardens. Height 23cm (9"). 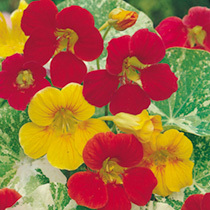 Easy to grow plants that will provide a blaze of colour in borders, tubs and baskets. The perfect way to clothe a dry, sunny border. HA - Hardy annual. Compact variety. Note: Flowers and leaves are edible and give a peppery flavour to salads.